I was born in January 1943 and raised in West Suffield. I grew up in a single parent family. In my junior high school days, a teacher used to fondly state that Suffield had more cows than people. I graduated from Suffield High School and joined the US Army. I spent 3 years on active duty, serving both stateside and overseas. In 1965, not long after my return, I married a girl from Enfield and had 2 daughters. In 1967, I joined the Enfield Pollice Department ending in 1970. I then began a 43 year career driving tractor-trailer. I purchased my own truck and became self-employed in 1980. In 2002, my mother passed and I returned to live in my boyhood home back in West Suffield. I have a strong sense of giving back to others. I served as a volunteer driver for the Disabled American Veterans (DAV) Transportation Network for 8 years before my appointment to head the Transportation Network out of the West Haven VA Hospital. Additionally, I served as the state Commander of the DAV from 2015 – 2016. It has always been my wish to get involved in the community proactively. 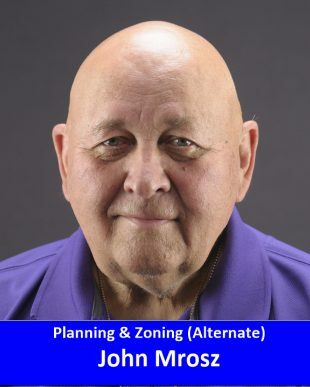 I am grateful that the DTC has endorsed me for the position of Planning and Zoning Alternate.